At our practice, we’re dedicated to making sure that your experience in the chair is always a pleasant one, so in addition to our decades of experience, we also use some of the most advanced dental technology available today. With the most modern tools at our disposal, we’re able to find, diagnose, and treat a wider variety of problems much faster while keeping your comfort priority number one. When you come to see us, you can trust you’re getting only the very best of what 21st century dentistry has to offer. Feel a little nervous at the dentist? If so, nitrous oxide sedation may be exactly what you need to “take the edge off.” All a patient has to do is breathe in the colorless, odorless gas through a small nasal mask, and within minutes, they’ll feel a deep sense of physical and mental relaxation. The mask will stay on during the entire appointment, and once it is removed, the gas’s effects wear off almost instantly, allowing a patient to quickly go back to their normal day without any lasting drowsiness. This handy little tool enables us to finally show you your smile from your dentist’s point of view. This small, camera-tipped wanted can be easily maneuvered through the mouth to capture high-resolution images of the teeth and gums that can be instantly displayed on a chairside monitor. With them, we can better explain to you exactly what we’re seeing and show why we might be recommending a particular treatment. This helps take a tremendous amount of mystery out of your dental care. 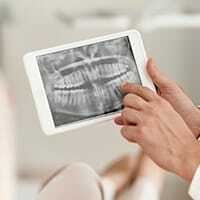 Digital X-rays allow us to do two things we simply couldn’t with traditional, film-based X-rays. One, they can create images almost instantly, and two, they drastically reduce the amount of radiation our patients (and us!) are exposed to. Plus, because everything is entirely digital, the images can be easily stored, sent, and displayed on a nearby monitor so your dentist can show you exactly what they are looking at and noticing. If you’ve ever had a dental impression taken with putty, then we bet it wasn’t exactly your favorite experience. With the iTero Digital Impression System, we can now keep the putty safely locked away. This instrument glides effortlessly through the mouth while taking hundreds of unique images as it goes. On a chairside monitor, you can watch as these images are quickly put together to make a fully 3D impression of your teeth. Not only is the process more comfortable, but it also creates a much more accurate model of your teeth. One of the most important things in dentistry is to catch tooth decay before it can develop into a cavity, and with the DIAGNOdent cavity detection system, this is now easier than ever. It uses a highly-concentrated beam of light to scan the enamel, and it can detect even the slightest bit of thinning that a traditional exam would easily miss. With this information, our team will be able to utilize quick and conservative treatments to reverse the process and preserve your teeth.